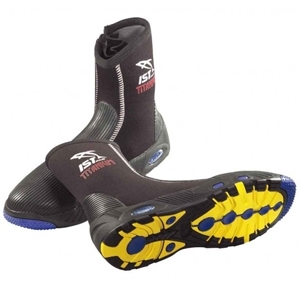 TITANIUM LINED 5MM NEOPRENE BOOTS WITH SNEAKER SOLE. Double-glued and blind-stitched shoe upper. Non-marking sneaker soles, heels and toe caps for durability and extra protection. Feaatures No.10 ultra durable YKK zip.